There will be no shortage of ingenuity at the 2019 West Linn-Wilsonville Middle School Science Fair, where student experiments concern earthquake detection, the relationship between color and food appeal, how to change the color of a gas, the energy generated by a toilet flush, the acidity of fruits and vegetables, non-traditional weed-killers, soil erosion, the effect of music on student exam performance, practical uses for bubbles and classification of computer viruses, among many other creative experiments. 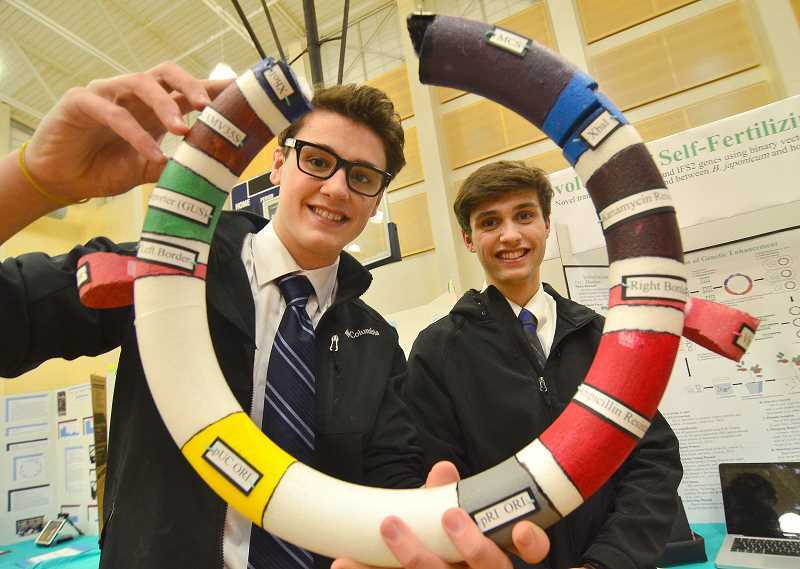 This ingenuity is one of the things Athey Creek science teacher, Ian Stober, who leads the school's Science Fair Club, admires most about his students in the club. The district is still looking for volunteers to help judge both the middle and high school science fairs. "In here, they get to experience science as a verb," Stober said. Science is more than a subject to study. It's questioning and engineering and solving, he explained. The nature to inquire about different things is especially prominent in Athey Creek sixth-grader Wyatt Foster. Foster's favorite part of Science Fair Club is "Finding things that make me wonder." It was simply this curiosity that sparked his idea to test whether it is possible to artificially color a gas. For David Burt, a seventh-grader at Athey Creek who was in Science Fair Club last year, the best part of Science Fair Club is getting to show his work at the fair. "When you come up with a new idea, it's cool to show it and show what you've learned," Burt said. Athey Creek sixth-grader Breanna Angeli, who wants to be an engineer when she's older, loves Science Fair Club because it allows her to "choose to be sciencey," she said. "In school you have to learn science but in this club you get to choose the kind of science you want to do." Wood Middle School science teacher and Science Fair Club Supervisor Sarah Haefner also believes the opportunity for students to choose their own experiment in Science Fair Club is important, but she emphasized that students don't need to be "sciencey" to join the club. "It doesn't have to be sciencey people," Haefner said. "If you're just interested in experimenting come on in." The West Linn-Wilsonville district science fair will be March 15 at Meridian Creek Middle School and feature science projects from students all across the district. At the district fair, students will compete for category awards, scholarships and special awards. Many students will go on to the Northwest Science Expo, the statewide science fair, April 12. Stober said Athey is usually well-represented at the Northwest Science Expo. Wood has done well at the state level as well. Wood sixth-graders Levesque and Cassidy Yourg earned third place out of 500 contestants at last year's competition for their experiment on what makes a strong bubble. As seventh-graders, Levesque and Yourg are expanding on their bubble experiment for this year's fair. By next year they hope to find a way to inject medicine into their durable bubbles to make kids more willing to take medicine. This type of creative problem solving is exactly what CREST Middle School Science Coordinator Mark Parrish hopes kids get out of the science fair. "I hope that the kids learn that just because a problem exists doesn't mean it can't be solved," said Parrish, who has helped students and teachers involved with the science fair at all four district middle schools for the past seven years. There is still time for interested students to enter in the science fair. "It's not too late join for this year or even if they're not into it for this year, it happens every year, so they can always join us next year if an idea sparks," Haefner said.